This removes the requirement to have the endlink attach to the strut. For the test phase I would just fabricate a bracket myself, but if this works I'll go to the machine shop and have a batch cut properly. 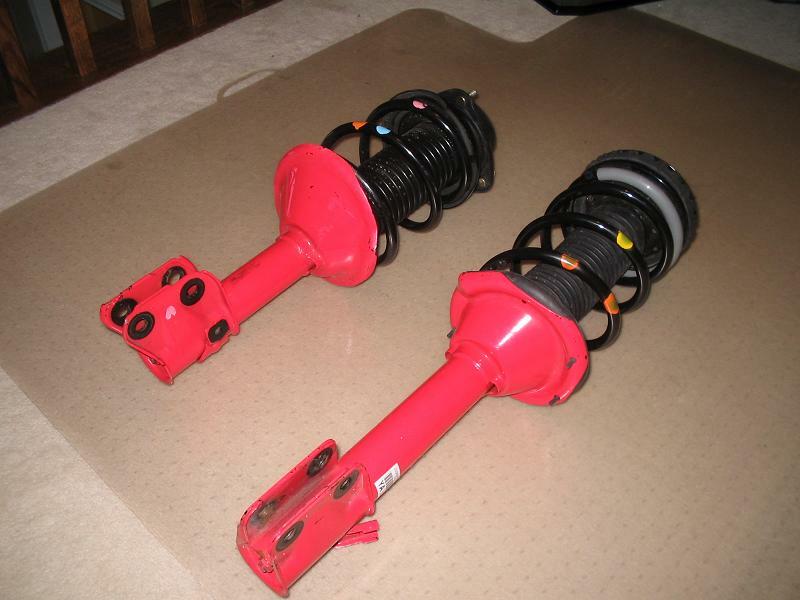 A member of the local Subie club has offered to let me borrow a spare v7 suspension he has since upgrading to coilovers. All I need it for is a mock up and fit test. He's confirmed that it uses the two bolt lower strut-to-knuckle mount in the rear (some Subies have a pillowball bushing in the rear). To the best of my knowledge, if the lower strut will attach to the knuckle, this should work. If the top hat won't fit is it possible to swap the SVX top hat from a Koni/GC system onto another coilover system? If that's possible the only fitment requirement is the lower mount. Is there any reason that the STi shocks won't work with the SVX's additional weight? I'm not worried about a two-year life expectancy or something, more a "will-this-thing-blow-up-if-I-hit-it-too-hard" sort of thing. If this works I would like to go straight to an aftermarket STi suspension, coilovers etc. The heavy spring rates should help negate the extra weight, right? I'm a rookie at all of this, so any of you more knowledgable types feel free to tell me I'm out to lunch. Last edited by Crazy_pilot; 11-19-2007 at 08:57 PM. Visit It's Just Eric's homepage! You will need to use the SVX top mounts, or drill out different holes on the body of your SVX. If you decide to use the SVX top mount, you will find the top of the strut rod is slightly different. We used a small metal collar. For the bottoms of the strut where they mount to the spindle. The spindle is thicker on an SVX than it is on the Impreza's. You will either need to spread open the flange on the borrowed STI struts or do what we did on the racer and use a grinder and remove metal from both sides of the spindle. 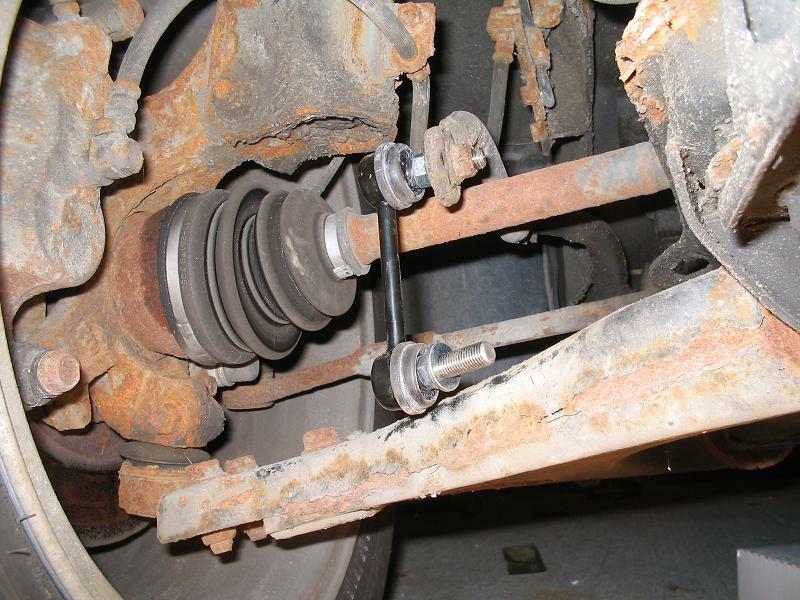 Looking at your picture posted, are you sure that there is enough clearance between the sway bar and the axle when the suspension drops? From that angle it looks fairly tight????? That's the normal position of the swaybar. The other end is still connected to the strut with the stock SVX link. Ok, but in the normal set up, the sway bar is attached to the strut and won't be dropping any lower, the axle in relation will be dropping away from it. With your set up, the control arm will be pulling the sway bar down as it does with the axle. I'm not saying that there will be a problem, just double check before you weld things into place. The sway bar is connected to the lower strut housing, which does move up and down. The bracket I would put would make the sway bar follow the movement of the control arm at that point, and the control arm and axle should remain roughly parallel as the suspension travels, so the sway bar should not come any closer or farther from the axle than it is right there. That's what my metal picture of the situation tells me anyway. Once the bracket's on and the strut is out I'll move the knuckle as far up and down as it will go to confirm clearance. Some V7 STi takeoff struts from Japan. Brand freakin new too, only about 5000 miles on them. Time to start measuring. 2010 Ford F-150 Lariat Crew Cab 166,948 miles: tow vehicle/ daily driver. Well I've hit a roadblock. The raised part of the STi front upper strut mount is too large to fit through the hole in the SVX. Th hole is about 3.75", and the raised part of the mount varries from 3.8-4.1". Also, the studs on the mount are more widely spaced on the STI, and need as much as 0.5" more space, which I'm not sure the SVX has to spare. All this points to needing to use the upper mount for the SVX in the front. I've also been doing some thinking about swapping the whole STI knuckle and hub into the SVX. They have different ball joints, but an adapter can be made to overcome that. The biggest problem I see is that with the STI knuckle, we will HAVE to run the Brembos. Nothing wrong with that, it's just a bunch more money, on the brakes and the rims to fit over them. I take it that was in responce to something from SickSubi about just selling some Brembros?! LOL I would bet it is. See you should have sold them to me instead, Sickboy! LOL! To be honest I do feel sorry that you had that option slip through your fingers. Would have been nice to stop the Supercharger in less than 200ft. LOL Wow that's a lot of "L.O.L. "s sorry, got carried away Let me know how it goes though I'd like to do something about my suspention and would like to know my plan like 6 months ahead of time. But at the cost of selling the Brembo for way less than what they are worth and thus FAILING! You could have done you're 6-speed for around $800 instead. Or have atleast posted up on here for offers. I could have come up with the money. I know my Impreza would be cool with it(though I'd have to then convert again now that I did 02' Rex brakes in the rear) I supose it's okay. I would like to see getting a set of Impreza Coilovers under these cars (heavier duty ones) Makes it easier to find stuff.